State recreation passport sales didn’t hit the goal that state park officials had hoped for last year, but it still proved a good year for Michigan state parks and other related camping programs. Michiganders purchased nearly 2.1 million passports in fiscal year 2013. The passports allow holders to enter all state parks, state recreation areas, state forest campgrounds, state pathways and 73 boat launching sites. Passport sales dipped during core summer months, according to Olson, who said the weather was cooler and may have kept some from going to state parks during a part of the year when additional passport sales are made on-site to those who opt not to purchase them when they renew their license plate. Passport sales spiked during June, July and August of 2012 due to the warm weather that brought people to the beaches at state parks. “We still have five percent who buy their passports in the summer months,” Olson said, suggesting that the choice to buy, or not, is, in part, weather driven. Others may not know what they get for the $11 investment. The recreation passport system was created in 2011 to provide steady, broad-based and sustainable funding to state parks, boat launches, state forest campgrounds and trails. It replaced the DNR’s former motor vehicle entry sticker which cost $24 for the season. Olson said more work is needed to better market Michigan state parks and the benefits that people get. State parks receive no general fund tax revenues. They are funded from passport revenues, the State Park Endowment Fund and the Natural Resources Trust Fund. The $11 per year fee, Olson said, is less than is charged by other states. 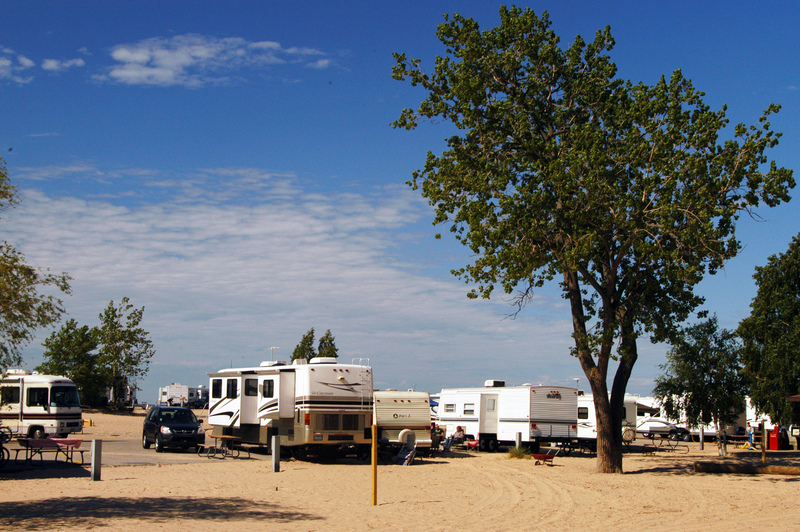 Despite the dip in passport sales, 2013 was a busy year for state park campgrounds. The system of parks recorded more than a million camp-nights during the season. It was the second year running that a million or more camp-nights were recorded following a slump in 2008 and 2009, a period of economic hardship for many, and when 860,000 camp-nights were recorded. “Things started to come back and in 2012 we got to where we were in 2005. We’re pleased with the outcome in 2013 even with the weather being less favorable,” Olson said. Michigan’s state park system still faces a $300 million maintenance backlog that includes 600 projects, from toilets and shower buildings to roads and sewers and electrical hook-ups, where improvements are needed. Olson said 17 percent passport participation is needed to break-even each year and that without additional passport sales it could be 70 to 80 years before backlogged project list is whittled down. Passport revenues also fund state forest campgrounds and trails. Program staffers say the cash infusion has helped. The program operates 128 smaller, rustic campgrounds and 56 non-motorized hiking pathways in state forests. “Without that (passport revenue) we would have to run the program only on the camping fees and that’s not enough to run the program,” said Anna Sylvester, the DNR’s northern Michigan field operations section chief for its Parks and Recreation division. Numerous improvements were made at state forest campgrounds in 2013. Those included picnic tables, fire rings, outhouses and water pumps. Staff patrols were also increased and the number of campers also climbed. The plan for 2014 is to reopen at least four of 12 rustic campgrounds that were closed in 2009 due to budget constraints. Those include Muskrat Lake in Oscoda County, Twin Lakes in Cheboygan County, Lake Marjory in Otsego County and Thunder Bay River in Alpena County. The Thunder Bay site will be operated by an Alpena-based concessionaire, according to Sylvester. The Forks State Forest Campground on the Boardman River in Grand Traverse County, known for its brown trout fishing and canoeing; Big Oaks State Forest Campground in Montmorency County; and Cedar River State Forest Campground in Menominee County. The latter two would open as equestrian camps. This entry was posted in Uncategorized and tagged Camping, Michigan Department of Natural Resources, State Forest Campgrounds, State Forest Pathways, State Parks, Trails. Bookmark the permalink.